The spa pump powers the spa jets and circulates the spa water in your hot tub. Most spas have a dual speed pump that can run at either a low or high speed. If your hot tub has a single speed main pump, it will usually also have a smaller circulation spa pump. 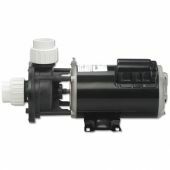 When replacing a spa pump, you want to match up the voltage, horse power and frame size. Spa pumps have either a 48-Frame or 52-Frame. Remember, over-sizing a replacement hot tub pump can cause damage and is not recommended. Aqua-Flo Fmhp 1 H.P. 2 Speed Without Trap-120V (02110000-1010) - Free Shipping!